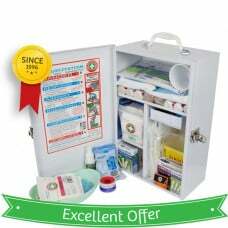 FOOD INDUSTRY COMPLIANT FIRST AID KIT SALE! LOW - most small cafes, coffee shops and food kiosks self-assess as Low Risk. HIGH - most Food Manufacturers and Restaurants using hazardous machinery or substances self-assess as High Risk. How PEOPLE ARE YOU COVERING? Also include the maximum number of customers or visitors you may have on site at any one time. SELECT YOUR PRODUCT BELOW OR CALL us now on the above number. 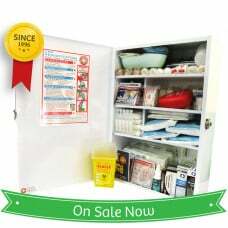 Our K705 Food Industry Compliant Wall-Mountable First Aid Kit has a durable powder-coated cabinet wi..
Our K805 Food Industry Compliant Wall-Mountable First Aid Kit has the very best first aid products a..
Our K905 Wall-mountable Food Industry First Aid Kit has the very best first aid products and ho..
Our K1005 Food Industry Compliant Wall-Mount First Aid Kit is as big as they come. 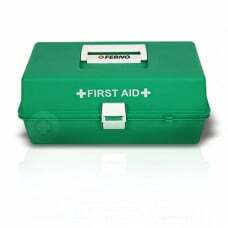 Housed ..
Burnaid medium commercial burn kit with all the right content to upgrade any standard first aid kit ..
Burnaid Large Commercial or Industrial Burn Kit BURNS FIRST AID GUIDE 1. Remove all clothing and..